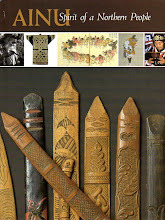 Songs of Gods, Songs of Humans: The Epic Tradition of the Ainu is filled with Donald Philippi's wonderful, musical, translations of Ainu yukar. The translations are accompanied by insightful commentary on Ainu culture and customs that enrich the reader's appreciation of each yukar. In addition to being a translator of exceptional skill, Philippi's extensive knowledge and love of music and poetry are what make these translations exquisite. The book is, unfortunately, out of print. Used copies can be tracked down through the internet, or in university library systems. It is very much worth the trouble it might take to find. 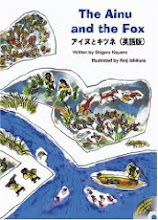 Arguably the most famous of Ainu folk tales in Japan is the first one in Chiri Yukie's yukar anthology. 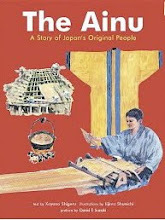 It has, in the past, been included in Japanese middle school textbooks as a token example of Ainu oral literature. 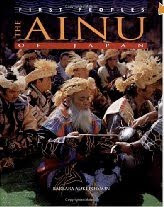 So if a member of the general public has ever heard or read an Ainu folk tale at all, it will most likely be this one. In her anthology, Chiri Yukie titles this story "The Song Sung by the Owl God: Shirokani pe ran ran pishkan." Shirokani pe ran ran pishkan literally means "Silver drops fall all around" in the Ainu language, but that seems to have little significance beyond the fact that the sound of the words represents the sound of the Owl's song. It is common practice for the Ainu stories to be labeled with the words that begin the story, and in this case the story begins with shirokani pe ran ran pishkan. The owl in this story is the shima-fukurou (striped owl), or Blakiston's Fish Owl, a now-endangered species that is traditionally worshiped as the guardian of the Ainu village. My English translation of this yukar is titled "Where the Silver Droplets Fall." "Where the silver droplets fall, where the golden droplets fall..." I sang my song as I descended on the air current. Passing above a human village, I gazed down and saw that those who had once been poor seemed to have become rich and those who had once been rich seemed to have become poor. I passed over the beach where there were young children playing with small toy bows and small toy arrows. "Where the silver droplets fall, where the golden droplets fall..." I sang as I passed above the heads of the children. The children ran along the ground below me, calling out to me and to one another. "Beautiful bird! Divine Bird! Come on everybody. Let`s shoot our arrows at it. Whoever hits it first is the bravest among us, a true hero." 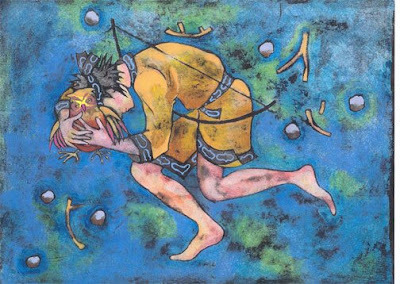 As they called out to one another in this way, the children of households which had once been poor but were now rich, fit their metal arrows into their metal bows and released the arrows at me. Many little arrows came flying towards me but I caused them to veer up or down and they all missed. Among them was one child who carried a bow and arrow made only of wood. I saw what the child was wearing and knew that he was from a poor household. But when I looked into his eyes, I thought he must be either the son or grandson of someone of good standing. He stood out among the others in the way he played. This child also fit his wooden arrow into his wooden bow and aimed at me. As he did so, the children who had once been poor but were now rich laughed at him and said, "Now that’s really funny! You silly pauper, that’s a divine bird. It will never accept your rotten wooden arrow when it won’t even accept our metal arrows. Not in a million years." They kicked him with their legs and hit him with their fists. But the poor boy ignored them and carefully aimed his arrow at me. I watched him and was moved. "Where the silver droplets fall, where the golden droplets fall," I sang as I drew a circle slowly in the sky. The poor boy drew one leg back and set it firmly behind him while setting the other leg firmly in front of him. He bit on his lower lip and steadied his aim. The arrow was released in a whoosh of air. The tiny arrow flew clean and straight towards me. I stretched out my claw and plucked that little arrow from the air. I sliced through the wind and fluttered to the ground. The children churned up the sand in little storms as they raced one another towards where I had fallen. I fell to the earth almost at the same moment that the poor boy reached me ahead of the others. He ran to me and grasped me in his hands. But the children who had once been poor and were now rich had caught up with him and endlessly abused him with harsh words and beatings. "You scoundrel. How dare you beat us to the bird!" And as the children abused him, the poor boy covered my body with his own, pressing me firmly against his belly. He wriggled and squirmed till he had escaped through a gap between the children. Then he leaped away from them and ran as fast as he could. Cooking is one of my many passions, and I have often re-created Ainu meals. This is not hard in Hokkaido, where I have access to the same food sources the Ainu had. In fact, much of their food traditions have been adopted by the Japanese who live in Hokkaido. This is particularly true of salmon, a food source so important to the Ainu that their common word for "food" was the word for salmon. The Ainu Museum in Shiraoi, Hokkaido, has an English section on their website that has some more information about Ainu eating habits. 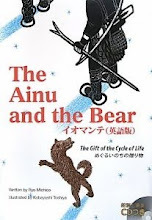 As I was translating Iyomante~meguru inochi no okurimono (English working title: The Ainu and the Bear~ the gift of the cycle of life), I was struck by how often food is mentioned in the story. At the start of the book, the men of the village return from a hunt laden with bear meat. This is served to everyone in the village in a rich, fatty stew-- a very rare treat for the villagers. The meat that is left over is cut into strips and dried on drying racks above the hearth. When autumn comes, the "trees groan under the weight of acorns and walnuts. The sweet smell of wild grapes and kiwi berries drifts on the air. The river teams with salmon, which cause the river to undulate with silver." The Ainu boy picks the sweetest of the berries and catches the liveliest of the salmon to take back to the bear cub, who has grown big enough to be put in a cage made of logs. When the date for the "bear-sending" is set, the whole village bustles with the food preparation tasks associated with the ceremony. As they make the millet wine, the women sing the wine-making songs passed down to them from their ancestors, and after a few days "a delicious smell wafts from the wine barrels." After the bear cub is killed, her spirit is invited to a party, a celebration with much eating, drinking, singing, and dancing. Wine is an important gift the bear cub takes back with her to the land of the gods. Later, it is the scarcity of food in the mountains that brings a different bear to the village-- a rogue bear, or "god-gone-bad," from which the Ainu boy, now a man, must protect his people. In fact, I think it is fair to say that the Iyomante ritual would not exist were it not for the never-ending and pressing need for food, and some sort of assurance that the source of that food will not be cut off. Traditionally, and on a daily basis, the Ainu recognized that their own lives were being sustained by the lives of others. The book closes with these words of the storyteller, "Children... listen carefully to what I have told you and remember it well. Every grain of millet, and every piece of meat and fish, contains the life of another. We feed on the life of others. We are part of a cycle of life. We all partake in the blessing of the cycle of life..."